The Mountaineer’s Route is not classic but does offer the most direct non-technical route to the summit of Mt. Whitney. While only rated 3rd class, poor routefinding or snowy conditions can bump the difficulty significantly. This is not just a hike and many people have died by getting off-route or being under prepared for snowy conditions. While technical climbing skills are not needed, routefinding and general “mountain sense” are. There are many reasons to climb the Mountaineer’s Route. For day hikers, it is a way to avoid the crowds and trail quotas of the Mt. Whitney Trail. For backpackers (who usually camp at Iceberg Lake), it is a way to avoid the competitive Mt. Whitney wilderness permit lottery. However, backpackers still must get a wilderness permit. Which SuperTopo guidebooks include a topo for Mountaineer's Route? 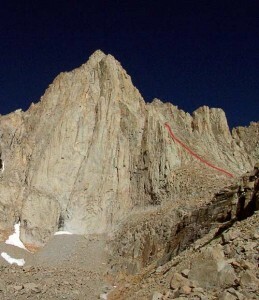 The route disappears behind the ridge and follows the gully to the summit. The route as seen from Iceberg Lake.